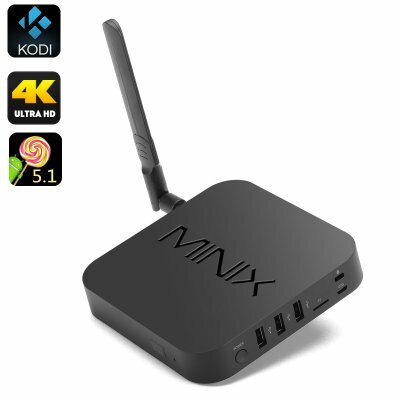 Successfully Added MINIX NEO U1 TV Box - 4Kx2K Ultra HD, Android 5.1, Amlogic S905 Quad Core CPU, 2GB RAM, KODI, Bluetooth 4.1 to your Shopping Cart. Looking for a high-end entertainment accessory to turn your TV into a first-class entertainment centre. The MINIX NEO U1 Android TV Box comes with Ultra HD video quality, a powerful Amlogic S905 Quad Core processor, dual band Wi-Fi connectivity and more. Top notch entertainment demands top notch video quality, and with the MINIX NEO U1 Android TV Box, you will be able to watch a wealth of content in 4K. Powered by the Amlogic S905 Quad Core CPU, the TV box will give you great speeds and overall user experience with zero lagging letting it effortlessly run games and multitask to your heart’s content. Thanks to the use of the latest software - Android 5.1, with the MINIX NEO U1 you will also have unlimited access to all the tools and apps you might need from the Play Store. With the internal memory of 16GB and the support of up to 64GB on an SD card, you will have plenty of space to keep your favorite content right on the TV Box. Thanks to KODI v16 coming preinstalled on this TV box, you will get access to all the latest movies and TV shows in a convenient and user-friendly interface. The MINIX NEO U1 comes with great wireless connectivity. You will be able to connect to other devices via Wi-Fi and Bluetooth. What’s more, you will have the latest Bluetooth 4.1. The MINIX NEO U1 supports Miracast, DLNA and Airplay, perfect for sharing games and movies from your tablet or Smartphone and viewing them on a large screen. The MINIX NEO U1 Android TV Box comes with a 12 months warranty, brought to you by the leader in electronic devices as well as wholesale Android TV Boxes.. Excellent box. WiFi is superfast like my Nvidia shield! I used the beast wizard with the minix xbmc and it works superb. I ordered it at Chinese new year so took a while to come. That's completely my fault but it was worth the wait.